Sow seeds of Begonia, Lobelia, Salvia and Pelargonium in a heated greenhouse or propagator to provide early plants. Sweet peas can be sown this month. Sweet peas sown earlier in the autumn can now be potted on taking care not to disturb the roots too much. Place them on a sunny windowsill, or on a high shelf in the greenhouse that gets plenty of light. This is the last chance to sow seeds that need frost in order to germinate (such as native tree and shrub seeds, and alpine plants). Plant lily bulbs in pots and in borders during mild spells. Summer bulbs, seed potatoes and onion sets will be available to buy from the middle of the month. Cut off old leaves of hellebores that produce flowers from ground level to expose the flowers. Cut away some Iris unguicularis leaves to expose the flowers. Root cuttings can be taken now. Papaver (perennial poppies), Verbascum (mullein), Acanthus and Phlox are suitable examples. Start cutting back grasses and other perennials left for winter interest. Alternatively you can leave them a few more months to provide cover for wildlife. 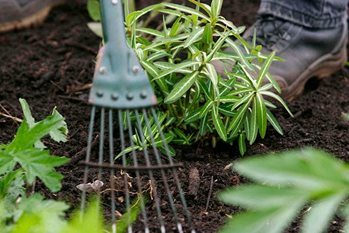 In mild areas, and during dry spells, you can still lift and divide herbaceous perennials. This will increase stocks, and revive tired or poorly flowering clumps. Rake up any winter debris and leaves off your borders to keep them tidy. Clear up any weedy beds ready for mulching in the spring. Collect leaves that have blown over alpine beds as these plants are easily smothered. Bare patches can be covered with gritty compost. Keep tubs and containers tidy, cutting back and removing debris regularly. They can be mulched with compost or grit. Grit is aesthetically pleasing, and will reduce the surface puddling that can occur when light composts are beaten into a solid ‘cap’ by raindrops. Some pots - particularly those sheltered by eaves or balconies - may need watering. Check the compost (at a hand’s depth) to see if it feels dry. Aim to keep pots moist (not too wet), but do not let them dry out. Raise patio containers onto feet or bricks, if you have not done so already, to avoid them sitting in the wet. Even in mild areas, tender plants that cannot be left outside with protection should really be taken into the greenhouse or conservatory by the beginning of this month. In cold areas, you are best moving things inside much earlier, in the autumn. Ensure protective straw or fleece is still in place on tender plants overwintering outdoors. Order catalogues for spring planting of summer-flowering bulbs, bedding and herbaceous perennials. Members can order seed from the RHS Seed Scheme between 1 November and 31 March. Stock up on store cupboard items such as string, stakes and canes for use later in the year. Inspect stored tubers of plants such as Dahlia and Canna for signs of drying out. Although care is needed to prevent dampness and rots occurring, it is important not to let the tubers become bone dry, or they will not grow next season. Keep alpine houses well ventilated. Remove dead leaves from around basal rosettes to prevent rotting. Protect new sweet pea plants from aphids. Check autumn-sown sweet peas growing in cold frames, and apply mouse and slug controls if necessary. Watch out for downy mildew and black spot on winter pansies. Remove any infected leaves and destroy badly affected plants. Look out for rots such as: crown rot, sclerotinia, Delphinium black blotch and black root rot on died down perennials. Check stored bulbs for signs of rot and remove affected bulbs. Be aware that many diseases will overwinter in the soil, or on plant debris. Antirrhinum rust and Delphinium black blotch, as well as sclerotinia, will lay dormant and re-infect plants when they come up the following year. It may be necessary to replant new specimens in another place if the problem is severe. Hellebore leaf spot can be a problem on old foliage of hellebores.